Wow! 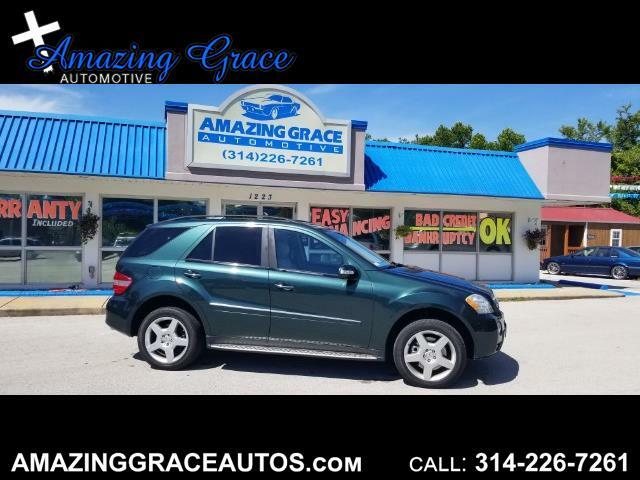 Just take a look at this beautiful 2008 Mercedes M-Class ML 550! This 4WD has a clean accident free Autocheck Report! This Mercedes has been serviced at Plaza Motors here in St Louis the majority of it's life! This SUV was kept in excellent condition! Drives like a new car! You will be proud to drive up in front of friends and family in your new car! Very spacious interior and very clean! What a gem! You will love this car if you come see it in person. It looks just as good in person as it does in the pictures. Clean inside and out! This Mercedes is powered by 5.5L V8 that is paired with a smooth shifting Automatic 7 speed Touch Shift transmission. Drives just like it should. Fully loaded with great features like NAVIGATION, Power Moonroof, Harman/Kardon Sound System, Back up Camera, Heated Seats, Leather Seats, Front and Rear Parking Sensors, Premium Pkg, Hill Descent Control, Hill Start Assist, Traction Control, Electronic Stability Control, 4 Wheel ABS Brakes, Anti-Theft System, Electronic Stability Control, Keyless Entry, Keyless Go, Front and Rear AC, AM/FM/CD/MP3/Multi-CD, Sirius Satellite Radio, Tilt and Telescoping Steering, TeleAid, Front and Rear Airbags, Front and Rear Side Curtain Airbags, Running Boards, Fog Lights, Alloy Wheels, Roof Rack, Daytime Running Lights, and so much more!